Phones, laptops, MP3 players... almost everybody has a tale of woe about a beloved gadget that has met with an unfortunate end. Usually involving a rather hard pavement. 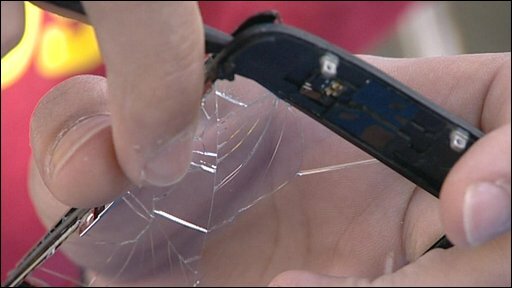 The BBC decided to find out whether it is worth giving these broken gadgets a new lease of life with a little help from a traditional repair man. "We are not perfect - it's in our nature to make mistakes and drop things on the floor," said Alex Perjescu, a gadget repairman who sees an average of four customers a day with smashed smartphones. For every four people who give Alex a call, countless others rely on their insurance - if they have it - for a replacement in the event of accidental damage. Check whether you're covered without realising it. Some warranties cover accidental damage (check the small print).Even if you do not have a warranty or specific insurance for the gadget you've broken, you might be covered under your home insurance policy if you have accidental damage or personal possessions cover. Unless you are sure you know what you're doing, be wary about trying to fix a problem yourself - it could make a relatively small problem worse and might invalidate any chance of claiming on a warranty or insurance. Don't throw a broken gadget out automatically - even if a problem looks disastrous, it could be relatively easy and cheap to repair. Use recommendations from friends or online recommendations sites to find trustworthy repair services. Contact them, explain the problem and ask them to give you a quote for repairing your gadget (get a range of quotes). Weigh up the cost of repairing against the replacement cost and age of the broken gadget plus any environmental concerns you have about throwing it away. But if your insurance doesn't cover it, or your excess is high, the cost can be eye-watering. A new eight gigabyte iPhone 3G, for example, retails at the Apple Store for £350. Alex, on the other hand, charges upwards of £60 to replace laptop and smartphone screens. "Usually if the price of the repair is less than 50% of the replacement cost then it is worth repairing it - otherwise it might be too expensive to fix," he says. However, asking around on the street, most shoppers had either not considered repairing their gadgets or had been advised against it. "The last thing I broke was a watch... I didn't think to repair it," said Charlie Adamson. Diana Hillsden dropped her mobile and took it to a repair shop. "They said that it was beyond repair. I asked maybe if they had Superglue or something. But they said they didn't." In the end she got a new one. When Ken Aldous' CD Player packed up, there was only one solution. "I got rid of it," he said. "You don't repair, not those digital ones, it costs as much to repair as it does to get a new one." But Consumer Watchdog Which? says that getting a replacement should not be seen as the only alternative. "When we asked people, eight out of 10 said that - at least it when comes to the smaller gadgets - they wouldn't even consider having them repaired," Which? researcher Jenny Driscoll told BBC Two programme Working Lunch. "But we think it could save you money."